If you are looking for some great family fun while taking a break from the beach, don’t miss a visit to Frisco Mini Golf and Go-Karts. Here visitors can choose between two go-kart tracks – one slick track for more advanced drivers and one family track with single and double karts. Kiddie karts are also available for children 5 years old and younger. After racing around the track, head over to the bumper cars and test your driving ability. Riders must be more than 48” and can be any age. No trip to the beach is complete without a round of miniature golf. 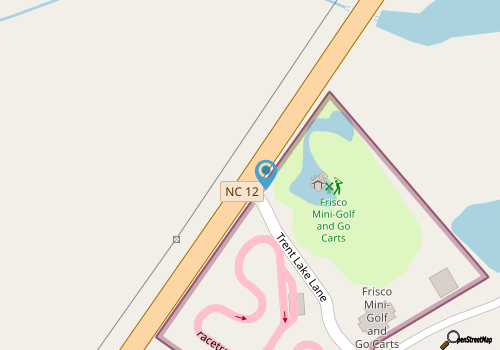 At Frisco Mini Golf and Go-Karts, golfers can show off their skill with an 18-hole championship course in a natural environment with waterfalls and goldfish ponds. Looking for some food while having all this fun? Head over to the concession stand for your choice of hot dogs, nachos, soft pretzels, chips, cotton candy, snow cones, soft ice cream, milkshakes, drinks and more. Mini Golf is $8 per person and children under six are free. Go-Kart rides are $9 and bumper cars are $5. Kiddie cars are also $5. Gift certificates and a large selection of shirts and sweatshirts with the park’s logo are available on-line. After one visit, you are sure to make this a tradition during every vacation to the Outer Banks. Call for off-season hours. Call 252-995-6325 for current hours.